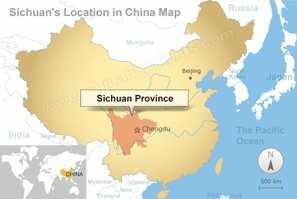 Zigong is the third largest prefecture-level city in Sichuan, and one of the industry centers in Sichuan Province. It is 215 kilometers away from Chengdu or about 3 hours by car. The Zigong metropolitan area occupies 4,372 square kilometers and the city proper occupies 814 square kilometers. The total population of Zigong is 3,255,800. The area code for Zigong is 0813 and the zip code is 643000. 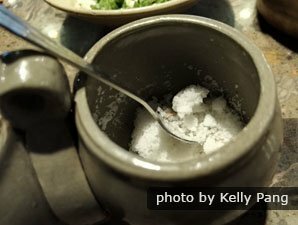 The salt industry in Zigong has a history of more than 2,000 years, so Zigong is renowned as the "Salt City". Since a vast collection of dinosaur fossils have been excavated here, Zigong is also known as the "Home of the Dinosaur". 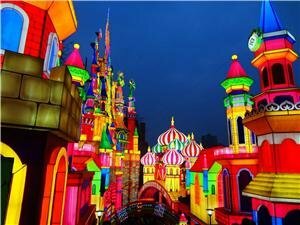 Additionally, as Zigong is the originator of the Chinese Lantern Festival, Zigong is also called "Lantern Town in South China". Zigong is famous for its salt industry from ancient China, and visitors can learn about the city with thousands of years of history through the Zigong Salt History Museum. 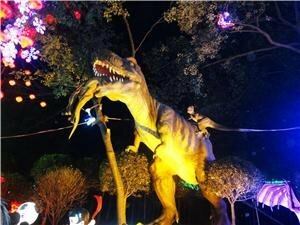 There are another two museums in Zigong, the Chinese Lantern Museum and the Dinosaur Museum, respectively exhibiting a variety of lanterns and dinosaur fossils. 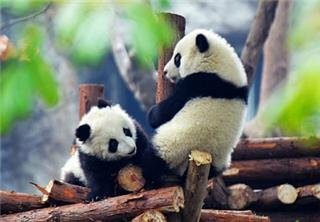 Our Chengdu memories tour is a well-designed tour combining the best in Chengdu, Zigong, and other cities in Sichuan Province. In 1959, at Deng Xiaoping’s suggestion, the Zigong Salt History Museum was built in the “Xiqing Assembly Hall” which was listed as an important cultural relic site under state-level protection by the Chinese Central Government. The Zigong Salt History Museum is the only salt history museum in China, and it is also one of the AAA state-level scenic spots. Zigong Salt History Museum was built in 1959. This museum mainly collects and displays cultural relics and materials from Chinese salt history. It also does researches on them. China has enormous experience in drilling wells, producing salt and using gas to make salt and has naturally achieved a high level in the salt industry. 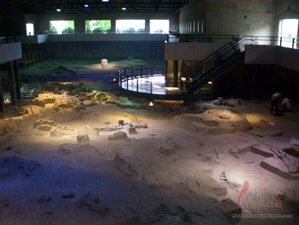 Exhibits in the museum cover the entire history of salt mining beginning from the Qin Dynasty. Here travelers can find many precious historical relics such as ancient drilling tools. The museum makes good use of advanced technology and uses various kinds of electronic displays to show the development history of the salt industry in Sichuan Province. There are also a large number of original tools and pictures. Zigong Salt History Museum has made great achievements in Chinese salt history research. Many books have been published by the museum staff such as “The History of Chinese Well Salt Technology ”, “The History of Zigong Salt Industry”, “The History of Sichuan Salt Industry”,” The Study of Chinese Ancient Drilling Tools”. In addition, a journal , “The Study of Salt Industry”, has been issued by the museum staff throughout the country. Because of the remarkable achievements in academic research and protection of historical relics, the Zigong Salt History Museum has been awarded successively the titles of “National Science Popularization Base” and “Sichuan Patriotic Education Base”. There are two ancient buildings standing in the Zigong Salt History Museum. One is the “Xiqing Assembly Hall” which was built in the year of emperor Qianlong by the Shaanxi salt tradesmen, and the other is the “Wangye Miao Temple” which was built in the year of emperor Xianfeng also by the salt tradesmen. Both of the two buildings are appraised as important protected cultural relics of the province. The two buildings have a splendid exterior and exquisite internal structure and decoration. They represent the highest level of architectural technology of their age. The Zigong Salt History Museum is located on the middle of the Liberation Road, opposite from the Department of Cultural Affairs. Take bus 1, 2, 3, 5, 8, 11, 31, 33, 34, 35, or 37 to get there. The Chinese Lantern Museum in Zigong is the only lantern museum in China. It is one of the Three Wonders in Zigong. The Chinese Lantern Museum was built in 1992. It is the only lantern museum in China and it plays an important role in collecting Chinese lanterns. Furthermore, it has also had an active and profound effect on the protection of Chinese traditional cultural relics, the research of folk customs and the promotion of traditional culture. As one of the famous scenic spots in Zigong, the Chinese Lantern Museum is waiting for travelers’ arrival. The Chinese Lantern Museum covers an area of more than 22,000 square meters. It is decorated with the Chinese lantern theme. The shape of the museum looks like a group of big palace lanterns. Its unique architectural style attracts many tourists. There are many exhibition halls in the museum, and their layout shows great originality. The museum has many precious exhibitions, such as lantern documents from the Paleolithic Age to the Republic of China, some special lanterns from both China and other countries as well as some competitive lanterns. The Chinese Lantern Museum is located in the Zigong Lantern Park. Take bus 2, 3, 8, 11, or 102 and get off at the Shanwan station, or bus 1, 5, 9, or 101 and get off at Yuankou. It covers an area of 66,000 square meters and is built on the renowned “Dashanpu Dinosaur Fossil Coenosis Relics”. The fossils and specimens cover the types of known dinosaur existing at the Jurassic Period, 205 million to 135 million years ago. It is the museum which collects and displays the most dinosaur fossil of the Jurrasic Period. It is the first museum specific for dinosaur and one of the largest museums of dinosaur relics. There are mainly three parts. In the first part, what is introduced is the basic knowledge about dinosaur, such as organic evolution, fossil, geologic era, the evolution and classification of dinosaur and so on. In the second part, various types of dinosaur fossils are displayed. In the third part, the bury relics of dinosaur are exhibited, showing the unearthing site of a big area. Zigong is located in the southeast of Sichuan Province. It is a hilly city and has a subtropical monsoon climate. The annual temperature here usually ranges between 17.5 degrees Celsius and 18 degrees Celsius. Zigong has a total bright sunshine duration of 1150—1200 hours per year and the annual total rainfall is between 1,000 and 1,100 millimeters. Among the four seasons in Zigong, the spring begins earlier than in other places, with temperatures rising quickly after Spring Festival. In summer, the temperature is high. It rains a lot and the precipitation is concentrative. Autumn here is short and it is always rainy. In winter, the temperature is not too low and it rarely rains. In general, the climate in Zigong is quite warm with four distinct seasons. It has plenty of rainfall and comparatively short hours of sunlight. It is usually cloudy. From March to October is the height of the tourist season in Zigong, while between May and August is the best time for travelers to visit. 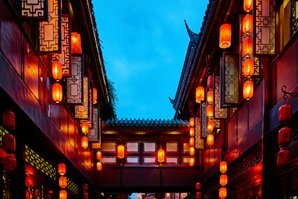 Traveling in Zigong, there are two festivals which visitors should not miss: one is the Lantern Exhibition during the China’s Spring Festival and the other is the Dragon Lantern Show. Zigong is a famous lantern city. Its Lantern Exhibition has a history of eight to nine hundred years. 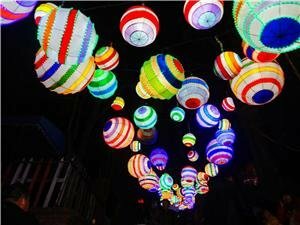 During the Lantern Exhibition, travelers can enjoy all kinds of beautiful Chinese lanterns. It is a marvelous scene. There is no civilian airport in Zigong. 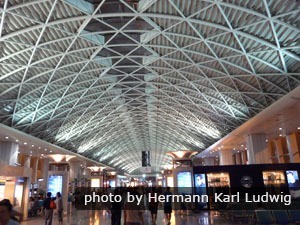 The nearest airports are the Chengdu Shuangliu International Airport, the Chongqing Jiangbei International Airport and the Yinbin Laiba Airport. There are shuttle buses from Zigong Bus Station to these airports. The first shuttle bus that goes to Chengdu airport starts at 8:40; the bus that goes to Chongqing airport starts at 8:20 and the bus that goes to Yinbin airport goes at 7:00, 9:35 and 14:35. It will take about 2 hours to get to Chengdu airport and Chongqing airport and about 30 minutes to reach Yibin airport. There is only one railway in Zigong --The NeiKun Railway which runs from Neijing, Sichuan Province to Kunming, Yunnan Province. There are four stations in Zigong: Zigong Station, Zigong South Station, Yuchong Station and Dashanpu Station. The Zigong Railway Station is located at the Luowan Road, Ziliujing District. Here travelers can take trains to get to Chengdu, Yibin, Chongqing, Shaotong, Neijing and other cities. The inquiry phone number of Zigong railway station is 0813-8705321. Starting from Zigong, passengers can take long-distance buses to get to Chengdu, Chongqing, Nanchong, Luzhou, Yibin, Deyang, Guang’an, Dazhou, Wuhan, Nanjing, Suzhou, Wenzhou, Hangzhou, Fuzhou, Xiamen, Guangzhou, Shenzhen and other big or medium-sized cities. Zigong enjoys convenient road transportation. There are highways connecting with Chengdu, Chongqing, Yibin and other cities within and province. There are more than 20 public bus routes in Zigong. The ticket price is one Yuan. Different models of taxis charge different prices. The major models of taxis in Zigong are Santana, Jetta and Fukang. The minimum fare is around 3 to 4 yuan per kilometer and every kilometers extra costs 1.2 - 1.4 yuan. From 22:00 to 6:00, it costs 1.6 - 1.8 yuan per kilometer. There is an old saying that “The essence of Sichuan cuisine is from Zigong cuisine”. Zigong is the home of well salt. The Zigong cuisine is characterized by a heavy but rich flavor and a strong aroma. With its special attention to seasoning, Zigong cuisine is famed for its pungency and spiciness. The beef here has a distinctive flavor. The recommended dishes such as Pepper Beef, Beef Hot Pot, Braised Beef, Salt Beef, Beef Soup and Roast Beef are all worth trying. 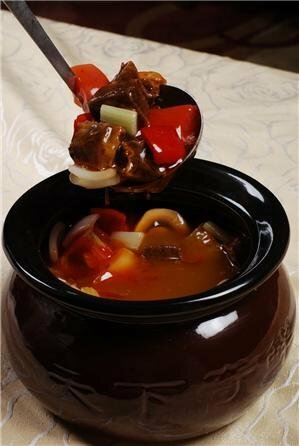 Among Zigong&apos;s beef dishes, the Fire Roast Beef is one of the finest. Although there are other beef dishes similar to it, the Fire Roast Beef is famed for its unique characteristics. As it demands great skill to slice the beef into thin slices, very few people can properly prepare it. The meat used for the Fire Roast Beef is only selected from quality portions from the cow&apos;s hind legs. Since its preparation is highly sophisticated, the method is a secret. In addition, rabbit meat and fish are also favorites among the locals. It is said that there are many famous restaurants on Tongxin Road, Shanwan Road and streets next to the Qiansheng Store. Traveling in Zigong, visitors must try and taste some famous local dishes such as DanDan Mian (spicy Chinese noodles), Zheng Chaoshou (a kind of dumpling soup), Qing Rongsin’s Soybean Curd Soup, Xie’s Bean Jelly, Yan’s Steamed Rice Glue and Bean Paste Rice. Old and famous restaurants: Among the old and famous restaurants are Tiande restaurant, Luming restaurant, Jingu restaurant, Xinjin restaurant, Minjiang restaurant and Huabei restaurant. Emerging restaurants: In recent years, there have appeared a group of emerging restaurants including Salt Dealer restaurant, Private Dish restaurant, Guildhall-styled Restaurant, Nanguoyan Restaurant, South Sichuan Restaurant, Shujiangchu Restaurant, A Xi Restaurant, Liu Fen Restaurant and Yanbangchuanren Restaurant. A tour of Zigong could be done as an extension to one of our popular Chengdu tours, or you may contact us for a tailor-made itinerary.